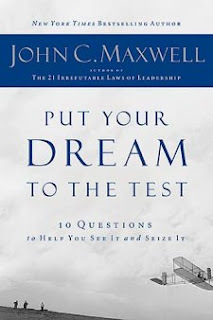 My next book in the Thomas Nelson Book Review Blogger program was John C. Maxwell's Put Your Dream to the Test. John Maxwell has written several books on leadership, most of which have dealt with developing your ability to lead others and impact the organizations you are a part of in a positive manner. This latest offering is slightly different. Put Your Dream to the Test focuses more on the individual's leadership of, well, their own selves. My opinion? Well, first a little background: I've worked in small business, big business, and now as pastor of a church, I have read and continue to read many books on leadership and personal development. Most of them are like Fridays at my college cafeteria: Monday's leftover potatoes met Tuesday's ground beef with Wednesday's peas, all reintroduced with the title "shepherd's pie." Most leadership books are just that, a remixed mash-up of other books, repackaged and retitled, but, in truth, you've got the same stuff. Rarely do you find a different approach, much less new material. This different approach is what you'll find in Maxwell's Put Your Dream to the Test. Rather than spoon-feeding inspiration with a helping of 'you can do it,' Maxwell provides the opportunity to discuss why you either haven't done it or why you will do it. This is the time-tested wisdom of someone with experience, not the fluffy hopes of a novice or newly-minted millionaire. It's the voice of experience that has set Maxwell apart in my mind since Developing the Leader Within You. The same power pushes through here. This is not a work based solely on someone who is an inimitable success, but rather someone who hopes to be imitated, and who provides examples from various individuals who dreamed big, some who succeeded, some who failed, all of whom eventually tested their efforts, and built lives that count as success. His examples are taken from modern business, historical facts, and Biblical truth. Useful? Absolutely. The younger the better. More info about the Thomas Nelson Book Review Blogger program is at http://brb.thomasnelson.com.